Know as "Coach Tank" to his players Alan Arrington was beloved by the Akron football community. Alan Arrington, assistant head coach and offensive line coach at the University of Akron, has passed away following a car accident in his native Mississippi. He was 44. Arrington was promoted to assistant head coach by Terry Bowden last fall. The Zips finished the 2013 season 5-7 after going 1-11 in each of the previous three seasons. "I can’t put into words how tragic this is," Bowden said. "We have lost someone who was truly special and had dedicated his life to guiding young men. Tank was a very good friend and a great person. My thoughts are with his family and those who had the chance to know him and play for him. In all my years of coaching I have never known someone who loved and cared for his players more than Tank. I have lost a best friend and I’m heartbroken." Arrington’s Akron players knew him as "Coach Tank." 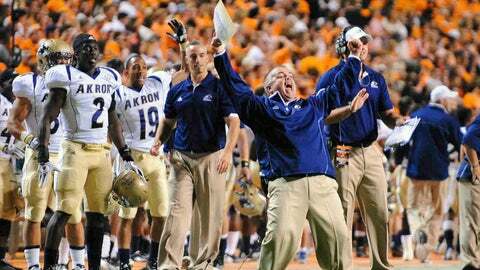 Arrington came to Akron before the 2012 season after working three years under Bowden at North Alabama. He’d been at North Alabama since 2006, following a stint at Northwest Mississippi Community College.